The 2014 documentary Manakamana portrays a set of pilgrims going up to and coming down from an ancient Nepalese shrine in a cable car. The Space is static, by way of a fixed, unmoving camera inside the car, while characters come and go, giving us brief, unselfconscious glimpses of their lives. 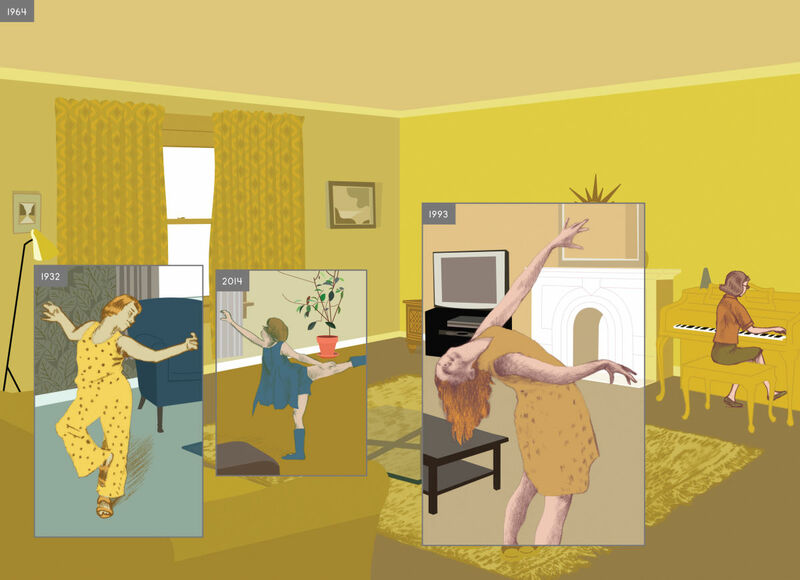 At first glance, Richard McGuire’s Here seems to have much in common with the film. The Space is fixed – a corner of a living room in a large house somewhere in the United States, where people come and go, talking often of the quotidian. Both, the film and the graphic novel seem non narrative, avant garde works of art on surface, but they both do have a certain narrative arc, as well as a meditative, even spiritual, quality about them. But while Manakamana still remains largely rooted in its ethnographic concerns, Here is a deeper meditation on time and memory, on love and loss. It is set not just in the here and now, but like a time machine, it spans millennia across the geologic time scale, and questions, and tries to answer, what it is to be human. Here is full of characters and narratives that appear, disappear, and at times re-appear, like fragments of memories, like lives lived earlier, like deja vu. What comprises a human life, it asks. Love? Death? Loss? People are often losing something – their keys, their eyesight, their lives – and these events are juxtaposed against a reality check comprising of vast expanses of prehistoric or futuristic glaciers and deserts sans human life. All of these mundane or momentous human moments are mere glimpses, flickers, in the march of Time. In fact humanity itself is a mere flicker, as we often enter time scales populated by other life forms, where human life and its grand projects are nowhere. “Where did the time go?”, a character wonders in 2014, just below a panel depicting the same setting in 3450 BC. An old couple fondly reminisce about how they met, and suddenly the scene moves to a jungle in the same space n 1623. The moment of remembrance is profound and then suddenly we are reminded of its banality, its sheer nonexistence in a way. “It happened so fast,” says a voice from another panel, from another era, while the old couple still reminisce. What is she commenting on? Life? A death? The act of falling in love? Meanwhile firemen douse a fire in the same living room in yet another time – another event that happened so fast. Panels often do the job of playfully commenting on each other. A dog barks in 1986, while a dog owner in the next panel complains about the dog barking, when you realise he complained in 1954. He goes on: “It’s symbiotic, it’s a little ritual they do (the dog and the mailman), a little performance.” Meanwhile, in a side panel, there’s another little ritual going on: “Do you have your keys? Watch? Wallet?”, a wife asks. “Check,” the husband smiles back. The ritual is repeated, even as the couple age, and then both the couple and the performance disappear. There is a note of silent elegy in their absence. The overlapping panels don’t just give the feeling of disjointed memories, and provide playful or ironic commentary, but the people often appear and disappear like apparitions in a dream. The narrative often takes on a surreal quality, with its parallel universes. “And life is but a dream,” McGuire seems to say, as he riffs on the children’s song ‘Row your boat’. “Merrilly, merrilly, merrilly, merrilly”, a celebrity sings on a TV show in 2015. Meanwhile a bison in 10000 BCE seems to be comfortably settled in the middle of a 1915 living room, with a young girl in 1970 sleeping right next to it. The panel placement is such as if the girl is dreaming of the bison. like a Magritte painting, perhaps. Dreams are what inspired perhaps the earliest examples of cinema, and the dreamlike quality of Here seems to borrow much from cinema as well. In fact it’s perhaps no surprise that Richard McGuire is also a filmmaker, apart from being an animator and a musician. Here seems to owe much to Soviet montage, and one sequence, an almost dance like movement that happens between a startled pigeon and an equally startled young woman, reminds of Norman McLaren’s renowned short film Pas de Deux. In another example, a series of panels consists of different girls in a visual progression spanning a century, with their arms outstretched in dance, as if in one symphonic co-ordinated movement, much like film editing. In fact Kubrick isn’t too far off either. At times there are visual puns. Two bent figures – one in 1986, tending to her sofa; the other, in 1872, bending forward, her arms extended in the same way, tending to her cow. Cinema is all about the alchemy of time, and the rhythm in Here is deeply cinematic as well. At times panels move by in a frenetic pace, followed by an eerie stillness of a prehistoric landscape. It’s as if time itself stands still. Dramatic shifts in color palette and styles, from watercolor to computer aided drawings enhance the sense of dramatic shifts in time as well. But Here is not just about tectonic shifts in time. No artistic work can be apolitical, and Here too refers to important events in history, but it is always through the consciousness of individual lives. Benjamin Franklin is present, less as a historical person, and more as a troubled father. In fact his argument with his son is echoed later, in a politely irritable exchange between another father and son, in 2005, perhaps the author himself and his ailing father. A 1943 radio broadcast asks its listeners to “stay tuned for an important announcement”. Politics also enters by way of the characters, for example, an interracial marriage in what is largely a house owned by white people. Lapses of memory are painful, but larger historical lapses of memory are worse. A group of archaeologists interested in Native American history visit the house in 1986. This house may have been built on a burial site, they tell the owner. In other panels drawn on either side of this same panel, stand a couple of Native Americans, from four centuries ago, listening attentively to something, perhaps to a call in the jungle. But the placing of the panels is not co-incidental. It looks as if the Native Americans are carefully listening to the archaeologist, listening to how history is narrated, or falsified, how collective memory is formed. Life is a palimpsest, written and overwritten by individual and collective memory. And a lot is lost on the way – loved ones, dreams, hopes, histories. But life is also about remembrance. “What do you want to be remembered for?” a character asks. That’s how we and our loved ones live on, through memory, our own, and historical. Here is about loss and the ephemerality of time and of our lives on this planet, but it is never nihilistic. If anything, it is about memorializing, about remembering, and trying in our own little way, to stop, or perhaps delay Time ravaging through our lives. Paintings and photographs capture Time and preserve memory. It is an utterly human response to make sure that the memory of a particular life is not lost, even though the life has been snuffed out. A woman in 1870 asks her painter companion why he won’t paint her, while in an overlapping panel a woman in 1974 shyly poses in front of her mirror, aware of being looked at, and probably posing for a camera. The theme of vanitas is present, of course, and is also evoked by the various Vermeer paintings hanging in the background, but it is an utterly human longing to be memorialized. In fact, a few pages later, in 1930, we see a painting on the wall of the same living room, and we realize it is a reproduction of the panel in which the woman in 1870 asks her partner to paint her. Someone else did paint the two, looking at them probably from the window of the same house. The woman is granted her wish and she does get memorialized, though she may have never known it. In the end, human lives, and indeed, human existence itself, is a tiny speck in the history of the universe, and Here makes us aware of the terrifying smallness of being. But it is also about memorializing, of preserving the small moments. And it is significant that the book considers the seemingly trivial moments, the quotidian banalities of everyday existence, and places them next to the epic, the cosmic. The commonplace is accorded the status of the poetic, simply by being included. The tiny, faded lives that once lived quietly in a small corner of the world are returned their status, in a way, and accorded meaning by being given the pride of place in the narrative. “It’s a book!” scream out a group of people playing dumb charades. Memories are what form our identities, our conscious selves. We are but palimpsests, we are the books of our lives. In the end, a woman comes into this same living room, not remembering what she was looking for. Finally she does remember, and yes, it’s a book. The narrative ends on remembrance, not in loss. Here is an elegy, but it is not just about losing, but about gaining something. That’s what living is.